The UPLIFT Monitor Arm provides easy fingertip adjustment of your monitor, with a generous range and two different models to accommodate most monitors. The pneumatic cylinder allows you to easily set your monitor to the correct ergonomic position. An optional laptop holder attachment is also available. You must choose the model that corresponds to the weight of your monitor, or the arm will not counterbalance properly. 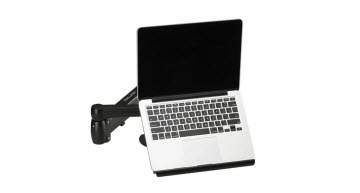 If you'd like to use the UPLIFT Arm with your laptop, add the laptop holder attachment, which mounts directly to the VESA plate. The laptop holder also comes with a swiveling circle platform for notepads and other small items (not recommended for mousing). The UPLIFT Monitor Arm has a 27.5'' horizontal reach and a 19'' height range. Is the monitor arm with the higher weight capacity sturdier? The only difference between the two models is their weight capacity. Both are sturdy, high-quality monitor arms, but if you try to mount a monitor that is lighter than the weight capacity allows, the arm will not stay at the desired height; instead, it will float up to the highest position. Likewise, if you try to mount a monitor that exceeds the weight capacity, the monitor will droop down. Do you have a dual version of the UPLIFT Monitor Arm? Yes! You can see the dual version of the UPLIFT Monitor Arm here. The model is determined by the weight of your monitor without the stand. You should be able to find this information online by searching for the model number of your monitor. It is important to choose the correct model, or the monitor arm won't hold its position. If you are unsure of the monitor's weight, give us a call at 800-349-3839, and we can help. I have an iMac that I want to mount. Will the UPLIFT Monitor Arm work for me? This depends on the year and version of iMac you have. For LED Cinema and Thunderbolt Displays and iMacs purchased before 2012, you can purchase a VESA mount adapter kit available from the Apple store, which will allow you to mount your display. For iMacs purchased after 2012, the stands are not removable; you must order a VESA-compatible version at the time of purchase. If you are unsure whether your iMac is compatible with the VESA mount adapter kit, we recommend contacting Apple to confirm before purchasing a monitor arm. The arm's clamp mount easily attaches to the back edge of desktops up to 3 5/8'' thick. There is no drilling required. How does my monitor attach to the arm? The UPLIFT Monitor Arm, like most monitor arms, attaches to your monitor with a VESA plate, which has two square-shaped hole patterns, 75x75mm and 100x100mm. The majority of monitors come with one of these two hole patterns. If you are not sure whether your monitor is VESA compatible, you can search for your monitor's specifications online, or give us a call at 800-349-3839, and we can help you find this information.